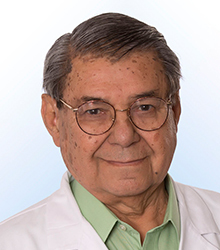 Shortly after completing a pathology fellowship at the MD Anderson Cancer Center in 1968, he joined the faculty there as an Assistant Professor. He stayed at the institution for 33 years, rising quickly through the academic ranks and earning numerous awards and accolades, including the Charles A. LeMaistre, MD Outstanding Achievement Award in Cancer. Dr. Ayala also held several leadership positions there, including Director of Surgical Pathology, Deputy Chairman of the Department of Anatomic Pathology, and Interim Head of the Division of Pathology. He assumed his current positions at Houston Methodist in 2004. Dr. Ayala’s research focuses on the pathogenesis of carcinomas of the lung, kidneys and ovaries. Human colors-the rainbow garden of pathology: What gives normal and pathologic tissues their color? Collagenous micronodules in prostate cancer revisited: Are they solely associated with Gleason pattern 3 adenocarcinomas? Kim, MJ, Divatia, MK, Lee, JH, Shen, S, Miles, BJ, Hwang, JH, Ayala, AG & Ro, JY 2015, International Journal of Clinical and Experimental Pathology, vol. 8, no. 4, pp. 3469-3476. Zhou, H, Ro, JY, Truong, LD, Ayala, AG & Shen, SS 2014, American Journal of Clinical and Experimental Urology, vol. 2, no. 2, pp. 156-60. Okoye, EI, Choi, EK, Divatia, MK, Miles, BJ, Ayala, A & Ro, J 2014, International Journal of Clinical and Experimental Pathology, vol. 7, no. 12, pp. 9061-9066. Choi, EK, Ro, J & Ayala, A 2014, Methodist DeBakey Cardiovascular Journal, vol. 10, no. 1, pp. 38-40. Miyai, K, Divatia, MK, Shen, S, Miles, BJ, Ayala, A & Ro, J 2014, International Journal of Clinical and Experimental Pathology, vol. 7, no. 5, pp. 2518-2526.